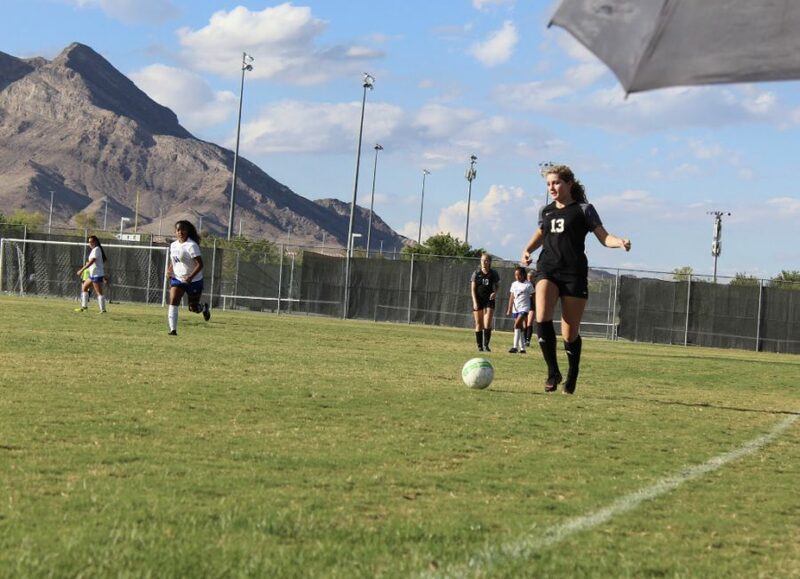 The girls’ varsity soccer team played their game against the Desert Pines Jaguars on Oct. 2nd with a vicious attitude that won them the game with a tremendous final score of 8-0. Though the Jaguars did put up a good fight, in the end, they were no match for the Panthers. In the first half, Junior, Taylor Crouch, quickly crossed the ball through the middle assisting Kassidy Sayles in the Panthers’ first goal of many. “[This] was my first game back in over six weeks because of an injury, so just getting back into the game was the most difficult for me,” Giammona stated. Giammona certainly didn’t let this game being her first one back be any different as not long after her last goal, she scored another goal bringing the score to 3-0. After the girls worked as a team to draw out the Jaguars’ goalie, Sayles was finally able to score a goal on an empty net raising the score to 4-0. Later on in the first half, after Kamryn Klinger kicked the corner kick, Taryn Phillips managed to score yet again another goal for the Panthers. The girls ran five more minutes trying to gain their possession of the ball back before getting back to their end of the field where Ariana Virella was able to make a side goal. Kamryn Sayles followed up this goal with another goal changing the score to 6-0. The first half ended with Giammona scoring another goal bringing the score to 7-0. For the beginning of the second half, the Panthers were told to pass the ball around and wait to score until after twenty minutes. This was because of the mercy rule, which said after eight goals the game would end early due to the winning team winning by such a large amount of goals. This was to make sure the other team didn’t lose by a lot. They also had to play at least twenty minutes of the second half before the referee would call it. This is Paul’J. Barney from WCTA. Just wanted to say, LET’S GO ARIANA! Nice article by the way, Ms. Faasse.